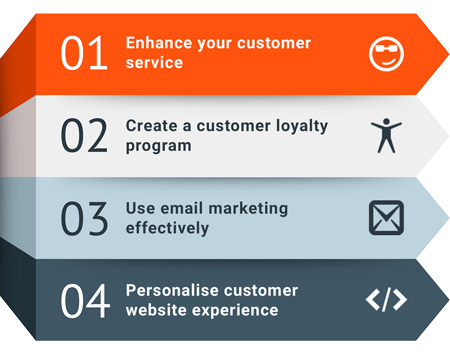 In any established business, once you’ve started to build your customer database, your focus should begin to shift to creating loyalty in those customers you have gained – in a word: retention. In a previous blog, we explored how to develop your retention strategy and how to measure your improvement. In this blog, we look at specific e-commerce retention strategies that may work for your business. Your retention strategy could include all of these ideas or just some of them. It could also include other ideas that are not listed here but that might benefit your specific business. The important thing is to understand which metrics you want to improve and by how much. Then tailor your strategy to achieve those goals. Also bear in mind that some initiatives require more time and money than others. When you’re first starting out, it makes sense not to invest too much in one idea until you know it’s working for you. For example, low-cost email marketing might be a good place to start. Then as your business matures and you’ve come to understand which strategies work best for you, you can invest more time and effort in those. It’s no longer enough to simply offer a decent product to your customers. If you want them to come back and buy from you again (customer retention), and/or refer your business to their friends (customer acquisition), you also need to provide an excellent customer service experience. Statistics show that 71% of customers won’t return if they receive bad customer service. Loyalty programmes can be extremely effective – or alternatively, a complete waste of time. To raise your chances of success, make sure your programme is significantly different in that it helps customers feel special and appreciated. Give them tangible rewards for being regular buyers and make sure you run your numbers to ensure the programme works for you too. When your customers do receive a reward, make sure they know why so you reinforce the behaviour you are trying to cultivate. Comalytics B2C software includes Reward Points functionality as standard in any package. This allows customers to earn points for certain actions they take on your site, like registering, making a purchase above a certain value or sharing to social media. The reward points can then be selected as a payment method on checkout. We also offer plug-ins to make it easy to give away free gifts based on certain criteria. This great article by Greg Ciotti explains how to create sticky loyalty programs, and Hubspot gives an overview here of the different kinds of reward programs out there. Regular emails help to keep you front and centre in your customer’s mind. Then when they are next looking for a product you offer, you will be their first port of call. Mails are also very easy to forward on to others, and so act as both an acquisition and retention tool. Personalising a retention email makes this even more effective. It helps to understand your customer’s needs and to be proactive in offering solutions. In fact, personalised mails can boost sales by as much as 50%. The look and feel of your site should grab the customer’s attention, and direct them to great content that encourages them to purchase. Your site should be fast and easy to navigate all the way from the product search process through to checkout. With so many customers now buying from mobile devices, it also needs to be fully responsive. Be clear on your shipping costs upfront and at checkout offer payment options that will work for your specific customer segments. Well executed live chat can also have a hugely positive effect on a customer’s experience of your website. Always aim to expand your customer’s view of what they can purchase from you. So if they are looking for one item, also show them others that are similar or complementary. If you offer products that lend themselves to it, make it easy for a customer to order regularly if they choose to do so. Perhaps they buy certain items frequently, for example, groceries. Or they might be interested in a subscription service for a weekly box of organic vegetables or a monthly box of six curated wines. Once you have a good retention plan that aligns with your business goals, and you’ve put some strategies in place, you’ll need to monitor your results closely. The metrics you’ve decided on will help you to measure your success over time, and to revise or fine-tune your plans if necessary. Bear in mind too that markets and buyer behaviour change, and technology is always moving forward. So even if your strategy works really well right from the start, you still need to keep an eye on changing conditions. That way you can make sure you are keeping up and also taking advantage of any new trends that might benefit you. Implementing the right retention strategies, carefully crafted to improve the metrics that matter to you, will help keep your customers very happy. It will also boost your sales and go a long way towards extending the lifetime of your business, so it continues to go from strength to strength. Contact us if you need any e-commerce assistance.